Sakarat® D Liquid Bait is here! 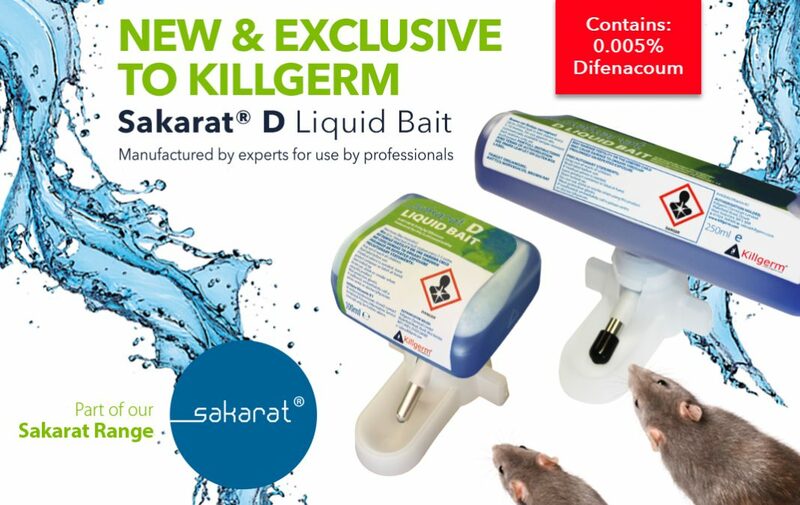 Introducing Sakarat® D Liquid Bait, the only liquid rodenticide bait formulation for use by professional pest control in the UK. Exclusively available from Killgerm, Sakarat® D Liquid Bait is a completely new formulation which is ready to use, saving you significantly more time and reducing the risk of spillages. Sakarat® D Liquid Bait contains water, the active substance difenacoum 0.005%, as well as many additives which makes it extra attractive rodents, especially when there is no other liquid around to drink. As a result, the rodents then drink more than necessary of the bait, which means they consume a higher level of the active substance over a shorter period. Previous articleOn 14th March 2018, the public health pest control sector got together in Malvern, Worcestershire for BPCA’s tradeshow, PPC Live. Error: Error validating access token: Session has expired on Sunday, 17-Feb-19 03:23:39 PST. The current time is Thursday, 18-Apr-19 21:39:06 PDT.